The Folding Bike Stand lets you display and store your bike in many different locations. The convenient height and features also makes it a handy tool to have around during bike repairs. It is designed for bikes that are 12-28" tall and has a mounting position at the rear hub axle for easy and convenient use. This bicycle display stand folds away for easy storage, and it features a lightweight design that lends itself well to easy transportation around town. A quick-release mechanism helps ensure safety standards. 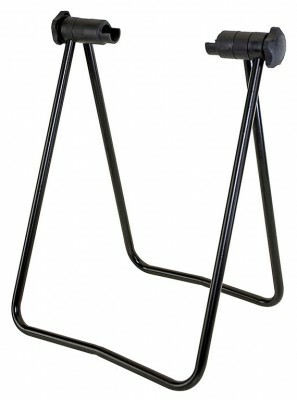 Made from durable, high-quality materials, this stand will last you for a long time to come.